The term High key typically refers to photos with dominant highlight tones. Most “correctly” exposed photos should have the key or main tone at the midpoint between white and blackpoint. By shifting the keytone up (high key) or down (low key), the photos can be made to convey different moods. High key photos can convey happy, relaxed mood while low key brings drama and tension. Typically high key photos are result of the combination of light foreground and background, narrow tone range (less contrast), and shadow-less even lighting. Some degree of over exposure helps but it should not be relied on solely. This tutorial will show you how to perform digital high key effect on color photos in Capture NX2. High key is well suited for portraits of happy women and children. An example with before-and-after comparison is shown below. Step 1: Open the photo in Capture NX2. A photo with both light foreground and background works best but most photo can work if you just want to emphasize the face. Step 2: Add an adjustment step in Edit list by clicking on the New Step button and select Black and White Conversion from the drop-down box, or Use menu Filter->Black and White Conversion, or use keyboard shortcut Ctrl-Shift-B. Move the Color Filter Strength slider to 100%, and adjust the Filter Hue slider until the subject face is the brightest. 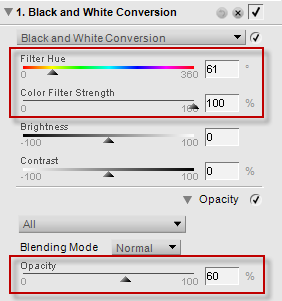 Filter Hue value of ~60 works well for typical skin tones. Expand the Opacity settings panel and set opacity to ~60%. This will let some hint of colors to get through. Step 3: Click New Step button in Edit List panel and add a new Levels & Curves adjustment step. Lighten up the photo using a curve similar to the one on the right. The curve like this also reduces the contrast, another characteristics of the high key effect. 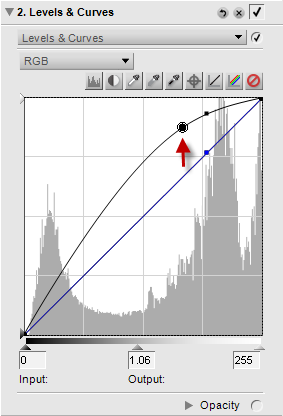 You can experiment with the curve adjustment until you are satisfied with the result. If you prefer, you can get slightly more contrast from eyes and hair by lowering the shadow part of the curve. Many people actually like the extra “pop”. Step 4 [Optional]: You can add additional softness to the image in order to give more delicacy to the overall photo. To do so, click New Step button in Edit List panel and add a new Gaussian Blur step. Set the opacity to 50% and adjust the radius until you get the result you are happy with. You have a few options: 1) Save the adjustment steps in a Capture NX settings file so you can apply the effects to other photos without repeating these steps manually. 2) Combine the high key effects with other effects, such as the one with darkened corners. 3) Experiment with various different curves, opacity settings, etc to see what different effects you can get. Want more Capture NX tutorials like this? Please subscribe to our RSS feed or email newsletter. As always, your comments and suggestions are welcome. Please use the contact form or the comment box below the post.